Charles Shook on Brick paved Northwestern Ave, looking north in 1920. In the 1920’s, demand for housing around Purdue University was high, as was the need for a Football Stadium. Purdue alum, trustee, and benefactor David Ross knew that in order for Purdue football to be competitive with other universities, they would have to build a football stadium. He looked at the topography of the land and found the perfect location. 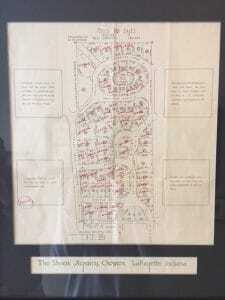 Only one problem—Robert and Charles Shook had it under contract to develop it into a subdivision. “The” place to live in town in the early 1920s was University Park, consisting of University Street, Waldron Street, and Russell Street, which is no longer a residential neighborhood and is now all Purdue associated buildings. Father and son founders of The Shook Agency (now Coldwell Banker Shook) Robert H. Shook and Charles W. Shook were to purchase and develop the land northwest of campus, extending University Park and residential housing for West Lafayette. As they were about to purchase the land, their friend, David Ross, approached them about moving the subdivision elsewhere. 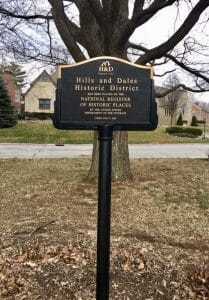 The Shooks located farm land for sale, which is now Hills and Dales and the deal was that David Ross was to buy the farm land for the subdivision, and then they would trade the land for the football stadium. David Ross made good on the deal and bought and owned the land for 1 day, before trading it to Robert and Charles Shook. David Ross purchased the land for Ross-Ade Stadium, built in 1924, and it replaced Stuart Field. Real estate developers Robert and Charles Shook took a real gamble purchasing a piece of property that was so far away from the university, according to Jim Shook, grandson of Robert H. Shook. It was farm land and a far walk from campus. 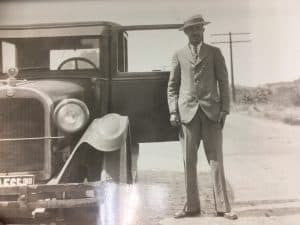 With the help of a land planner named Mr. Sheridan, Hills and Dales was developed; city water and sewer were put in and concrete streets poured. With such a strong infrastructure in place, the Shooks built about half a dozen spec homes during the 1920s with the assistance of a young architect, Walter Scholer. These spec homes set the tone of the neighborhood. Many Purdue faculty filled in the rest of the neighborhood during the 1930s. Even though it was the Great Depression, Purdue Faculty only took 2 pay cuts that decade. 5% then 10%, still leaving enough money for some to build lovely new homes. Professional community members also built because of the attractive location. With the installation of Hills and Dales it redirected the residential growth of West Lafayette north of Purdue University. The West Lafayette Community School Corporation, led by Superintendent Burtsfield, bought a parcel of land adjacent to Hills and Dales. Residents of West Lafayette were baffled as to why the school corp would purchase land so far outside of town. The residents affectionately referred to the purchase of this parcel, on the northern fringe of town, as Burtsfield’s Folly. The Junior/Senior High School was built in 1939 at a cost of $225,000. In the 1930s, the land surrounding Hills and Dales was farm land. In fact, Robert H. Shook’s grandchildren, Jim Shook Senior, born 1931, and brother Wesley Shook, born in 1929, resided in 606 Northridge Drive. At the time, their house backed up to Smalley Farm. There were cows out their back door. Later on, Smalley Dairy Farm became the Ridgewood Addition developed by Haven Smalley and later the Golden Hills addition was developed by owner George Boes of Boes Farm. The Ridgewood Addition, Golden Hills Addition, and Hills and Dales, are all commonly referred to as Hills and Dales. It is important to note that they all had different developers and were completed in different years. The Frank Lloyd Wright house is in the Ridgewood Addition and was commissioned by John E. Christian in 1954. It was one of the last homes built in the addition. 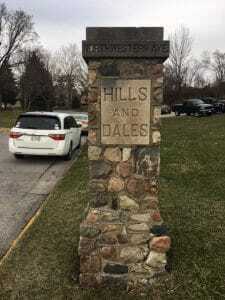 Hills and Dales is constantly evolving as residence renovate, add-on, and update their homes. 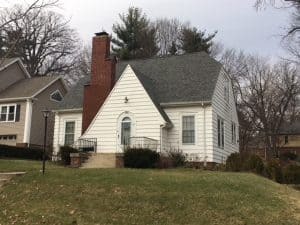 The neighborhood is one of West Lafayette’s most coveted because of it amazing location, architectural beauty, and rolling hills with wooded lots. Interesting fact—every Hills and Dales lot had 3 trees planted on it (2 Soft Maples and 1 Hard Maple). This wooded neighborhood was previously treeless farmland. We can thank the developers for the gorgeous trees. It is strange to think that the neighborhood wouldn’t be there if David Ross hadn’t insisted that the Purdue football stadium be built where is stands today. Hills and Dales was brought about because of the football stadium, and today its proximity to the football stadium is one of its greatest features. Wonderful article Lauren, very informative, some of which I knew, but learned quite a bit from the article. Thanks so much for sharing. May we share it with clients? Of course, Pat! Glad you enjoyed it! Nice job Lauren! Thanks for sharing, it is very well done and super informative!